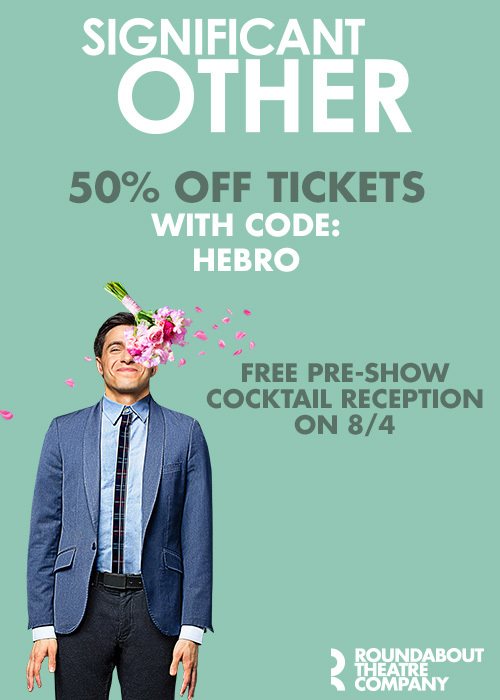 Hebro Night Out: Join Hebro’s from around NYC at Significant Other, a show about a single gay Jew in NYC! Save 50% on our night out performance of Significant Other on Tue, Aug 4 + a free pre-show reception! All seats $40.50 (regularly $79). In this “hilarious and heart-tugging” (Daily News) quarter-life coming-of-age story, Jordan Berman would love to be in love, but that’s easier said than done. So, until he meets Mr. Right, he wards off lonely nights with his trio of close-knit girlfriends. But as singles’ nights turn into bachelorette parties, Jordan finds that supporting the ones you love can be just as impossible as finding love itself.